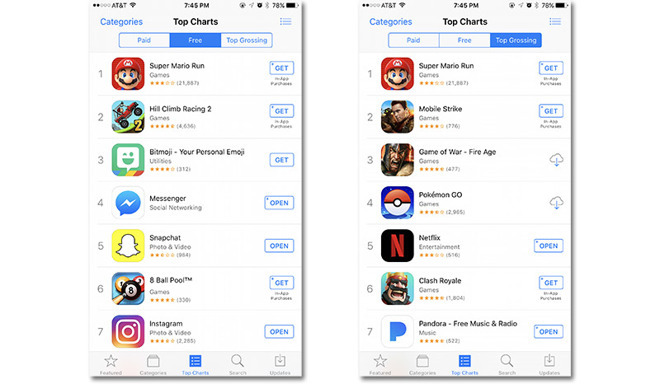 As seen above, Super Mario Run is listed as the most popular free app on the U.S. iOS App Store, while at the same time coming in at No. 1 on the highest grossing list. The app debuted to much fanfare on Thursday. While free to download, Super Mario Run includes an in-app purchase that is all but required to actually play the game. Paying the $9.99 entry fee provides full access to all six game worlds, 20 Toad Rally tickets and 3,000 coins. Without the unlock, gamers can only play through three levels before being rate limited to 20-second try-outs. At the time of this writing, Super Mario Run has an average 3-star rating with well over 21,000 reviews. Considering the speed at which Nintendo's title soared to the top of Apple's charts, it is likely that both companies are making significant gains —more so for Nintendo —from gamers eager to get their hands on Mario's latest adventure. Announced in September, Super Mario Run is Nintendo's first official attempt at an in-house iOS game. Hyped for months, the release might have temporarily crashed Apple's online storefronts due to expectedly high demand. For those who tried out the sample levels, or have yet to download the title, and are on the fence about dishing out $9.99 for a full unlock, make sure to check out AppleInsider's in-depth review.